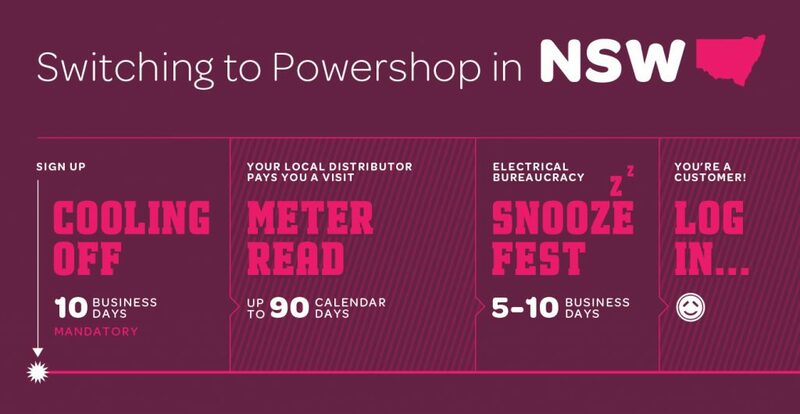 This post is for NSW residents that are switching to Powershop and want to understand when their Powershop account will actually start. Firstly, a person in a van (your distributor) will drop by to get an actual reading of your meter. This allows you to get a final bill from your current retailer and become a Powershop customer. As meters are read every quarter, it may take up to three months for your final read to take place. If we can, Powershop will try to get the person in the van out sooner. You can usually find when your next scheduled read is due by checking your last electricity bill. After the meter reading, there is a bunch of boring industry stuff that needs to happen before we can make your account active. All up, it could take three to four months to become a Powershop customer. If you’re wondering, give us a call and we can give you an idea of how long it’ll take to switch. You’ll be sent your Powershop account log in details once your switch is complete. In the meantime, you can download the app and have a play in the demo mode. Read previous: Powershop Australia helps light up Vivid Sydney!